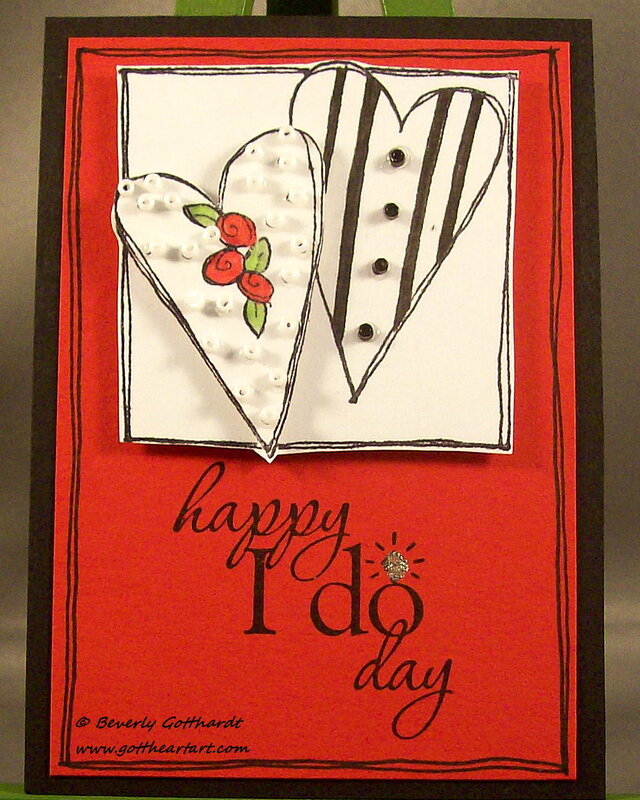 Black, White, and Red have been popular wedding colors for a few years now. When I first heard of that I thought hmmm, but it only makes sense--a white dress, a black tux, and red roses, how can you get more elegant than that. This heart stamp is one of the very first rubber stamps I ever bought and it has served me well. I have used it in many different configurations and colors. 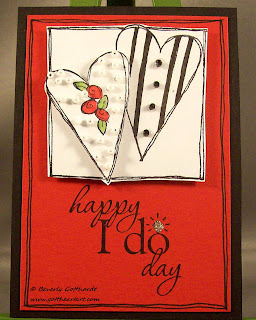 The happy I do day is a stamp from Stampin' Up. I glued the tiny beads on using tweezers and colored the roses and stripes with Copic markers. Don't panic Design Team at Wicked Wednesday you haven't lost a whole week, I know this isn't Saturday, but when you give me a challenge that I know exactly what stamps I will use, Wednesday it has to be and believe it or not I actually have got to work in my studio today without excessive interruptions--YAY! Join in on the Summer Wedding fun at the clickable link above. ATCs are quick and fun to make. wow Beverly this is just stunning & a perfect wedding ATC. I really love that sentiment stamp!! Thanks again for joining us at Wicked Wednesday! What a wonderful little creation! I just love the hearts "dressed" in wedding attire...very smart! You're so quick this week...maybe you'll find the time to make another entry before next Wednesday, you know we love having you join us!